Addis Ababa (Agenzia Fides) - Patriarch Matthias I and the Holy Synod of the Tewahedo Orthodox Church of Ethiopia have decided to offer 16 days of fasting and prayer that precede and follow the liturgical solemnity of the Dormition of St Mary Mother of God – (celebrated August 15), to invoke the gift of peace and reconciliation in Jijiga and in the Somali region, after ethnic violence, which in recent days, exploded in that part of Ethiopia, causing about 30 victims. 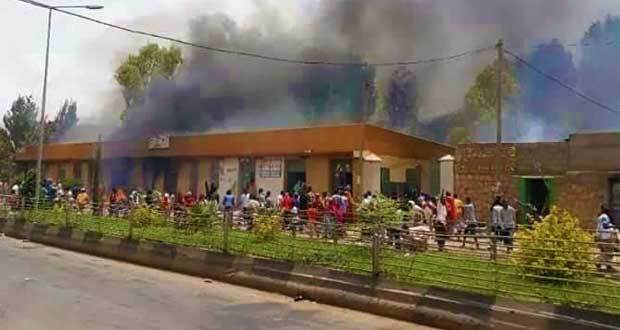 The Ethiopian Orthodox Church has paid a high price due to the spiral of violence: according to information by local media, at least seven Orthodox churches have been attacked and set on fire, and local sources speak of at least six priests and several faithful killed. The clashes began at the end of last week, when armed men of the Liyu militia, of ethnic Somali and under the orders of Abdi Illey (President of the Somali Region) tried to interrupt a meeting between members of the regional parliament and representatives of the city of Dire Daua, with the intent of denouncing the violation of human rights in the region. The incidents of violence caused the intervention of the Ethiopian army, which deployed its troops also around the institutional headquarters, including the building of the regional parliament and the presidential palace of the same Abdi Illey. A massive intervention was followed by attacks against targets linked to minority ethnic groups, fomented by members of the Liyu militia. The spiral of violence also accentuated the contrasts between the regional administration and the government of Addis Ababa, also leading to the resignation of regional governor Abdi Illey, who in the last hours - as reported by local media - has also been arrested and placed in custody by the authorities of Addis Ababa. The Somali region has been unstable for some time. Prime Minister, Abyi Ahmed, wanted to make his first visit to that area of the country after taking office at the beginning of last April. At the moment - according to official sources of the Tewahedo Orthodox Church - more than 20,000 displaced Ethiopians are supported and assisted by the Orthodox parishes of Jijiga. Prayers to protect the region and invoke Mary's peace here and wherever her protection is needed.